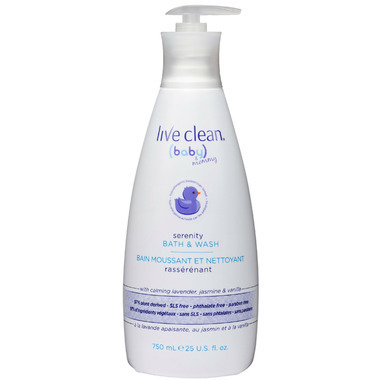 Live Clean Baby & Mommy Serenity Bath & Wash is a rich creamy cleanser formulated to calm and comfort babies before bedtime, nap-time or anytime baby is a bit fussy. With a unique blend of calming, time-tested natural aromatics of Lavender, jasmine, Vanilla and Chamomile extracts known to promote relaxation and sleep. Not just for baby, Mommy needs serenity and calming too! I love all live clean products and this one is no different. It foams nicely in the bath and the bubbles stay around to play with! Also love the soothing scent, it isnâ€™t too strong and I totally believe it helps my girls get ready for bed! I bought this thinking it was natural, but the sent (which is nice mind you) is very strong and I find lingers too much on my sons skin and hair. I have stopped using it because of that. Love love love!! We got a sample from the hospital as my daughter was born. This was so gentle and smelled amazing. The lotion is also just as great. My fav all around baby collection. Our favourite soap for bath time and smells amazing. Creates just enough bubbles too. This is our favourite soap! Love the scent, gentle on the skin and eyes, and leaves hair feeling soft and clean. Only soap we use! Smells so nice mild and sweet! Our dude is 5 and still using this and cleans off dirt of an outside playday but gentle enough can go in eyes without noticing! I've been using this on my son since he was a few days old, he's now 14 months, and his skin has always been great with it. Love every single one of the Live Clean products we've tried. Great value! I've tried several baby washes and this is by far my favourite! My mother is even using it for herself now. Makes great bubbles for bath time fun, smell is soothing and it's great because I can use it for both us. Do enjoy the Live clean line. Great product for if you child is in need of a little relaxation before bedtime. This is my favorite product to use on my daughter. Its scented so nicely and doesn't hurt if it goes in her eyes. Soemtimes I use for body wash for myself too. I recommend this brand over all other brands. Love the smell and that it's a natural product for a great price. This smells amazing! I love the gentle moisture scent, so I was hesitant to try a different scent. But this may be my new favorite! The smell lasts a long time on my little ones:) Highly recommend! Love his product ... It's doesn't dry out my sensitive skin...smells amazing !